2003-10-17 Assigned to MEDLOGIC GLOBAL LIMITED reassignment MEDLOGIC GLOBAL LIMITED ASSIGNMENT OF ASSIGNORS INTEREST (SEE DOCUMENT FOR DETAILS). Assignors: STENTON, RICHARD J. An applicator for dispensing two separate tissue adhesives includes a generally elongate body having two distinct interior regions, each containing one of the two tissue adhesives. Hinged levers associated with each region selectively force the expulsion of the adhesive from the end portions of the applicator in response to application of force by the operator. In accordance with the invention, an applicator is provided having first and second end portions from which first and second distinct fluids are dispensed. The applicator includes a housing assembly defining first and second separate regions adapted to contain the first and second distinct fluids, the first and second regions being in fluid communication with the exterior of the applicator at said first and second end portions of the applicator, respectively, and being separated from each other such that the first and second fluids do not intermix within the housing assembly. The applicator further includes a first pressure device for imparting sufficient pressure to the first fluid to cause egress of same out of the applicator at said first end portion. FIG. 5 is a view showing the use of the applicator of the invention to apply a more flexible tissue adhesive to the incision of FIG. 4. FIGS. 1A and 1B are respectively a left side elevational view and a top view of an applicator  100 in accordance with the invention. Applicator 100 comprises generally a housing assembly 102, and has first and second end portions, 104 and 106, respectively. Applicator 100 is designed to segregate two masses of fluid contained therein (not shown), and to selectively dispense the fluids from end portions 104 and 106. FIGS. 2 and 3 are cross-sectional views of applicator  100 taken along lines A-A and B-B in FIGS. 1B and 1A, respectively. Housing assembly 102 includes a generally elongate body 202 capped at one end by annular structure 204 and at the other end by an end cap 206. Housing assembly 102 defines a chamber in which are disposed a pair of deformable tubes 208 a and 208 b, each at least partially containing within an interior region (210 a, 210 b) thereof a hermetically sealed ampoule (212 a, 212 b) of a suitable adhesive. Preferably, ampoule 212 a contains a strong, fast-setting adhesive such as n-butyl cyanoacrylate and pentyl cyanoacrylate, while ampoule 212 b contains a more flexible tissue adhesive such as octyl cyanoacrylate or hexylcyanoacrylate. Other types of adhesives may also be used, as detailed below. It will also be understood that in some applications, the two ampoules 212 a and 212 b would contain the same adhesive compound. Regions  210 a and 210 b are separated from each other such that intermixing of the contents of ampoules 212 a and 212 b will not occur when the ampoules are unsealed, such as by crushing, in the manner detailed below. Separation is effected primarily by a center joiner 214 serving to retain the ends of tubes 208 a and 208 b, and configured as a generally tubular structure with a central impermeable barrier 216 formed therein. Retaining the opposite end of tube 208 b is annular structure 204, which serves as a conduit for fluid communication between region 210 b and the exterior of applicator 100. Similarly, tube  208 a is supported at its opposite end by end cap 206, with tube 208 a fitting between the exterior of end cap 206 and the interior of body 202, as detailed in FIG. 2A. Abutting end cap 206 is a nozzle 218, which is provided with a central channel, in registry with a central channel formed in end cap 206. These central channels form a fluid conduit 220, permitting fluid communication between region 210 a and the exterior of applicator 100. Filters 222 a and 222 b are disposed in the fluid flow paths between interior regions 210 a and 210 b and the exterior of applicator 100, and serve to prevent passage of pieces of ampoules 212 a and 212 b to the exterior of applicator 100, without hindering the passage of the adhesives contained in the ampoules. A spherical, microporous tip 222 a is also provided, in the region of the end of conduit 220, to aid in the spreading of the fluid. Pressure devices, such as hinged levers  224 a, 224 b and 224 b′, are provided in order to selectively and controllably impart force from an operator's hand (not shown) to tubes 208 a and 208 b, thereby unsealing ampoules 212 a and 212 b by crushing them, and ultimately forcing the egress of their contents out of applicator 100. Hinged levers  224 a, 224 b and 224 b′ have respective leveraging portions (224 a l, 224 b l, and 224 b l′) which engage the operator's fingers to receive therefrom inwardly-directed pressure-that is, pressure in the direction of the applicator 100. Hinged levers 224 a, 224 b and 224 b′ also have respective plunger portions (224 a p, 224 b p and 224 b p′) which engage tubes 208 a and 208 b-directly as shown or indirectly through some other known force-transferring mechanism-and convey the force from the operator's fingers to the tubes, deforming the tubes and crushing fluid-containing ampoules 212 a and 212 b therein. To facilitate the hinged action, hinged levers 224 a, 224 b and 224 b′ are rotatably-attached to housing assembly 102, preferably to elongate body 202, at points 224 a i, 224 b i and 224 b i′, respectively. The attachment is preferably by way a flexible connective bridge, of integral material with the lever and/or elongate body 202. Alternatively, a conventional hinge-type arrangement (not shown) may be provided for that purpose. The plunger portions 224 a p, 224 b p and 224 b p′ of levers 224 a, 224 b and 224 b′ are shaped such that their contours and volume at the point of interaction with tubes 208 a and 208 b allow for good control of the volume of fluid being squeezed out of regions 210 a and 210 b during the inwardly-directed motion of the levers. The materials of the components of applicator  100 are selected to be compatible with each other, and with the adhesives contained in ampoules 212 a and 212 b, particularly for those components intended to come into contact with the adhesives. Biocompatibility is also important, to reduce the risk of injury and/or toxicity to the patient. When the adhesives are cyanoacrylates, materials that are non-reactive with cyanoacrylates would be selected. Polymeric materials can be used for the components of the applicator 100, so long as the polymeric materials are compatible with adhesives (that is, the applicator components will not readily degrade in the adhesives, the adhesives will not degrade the applicator components, and the applicator components will not effect polymerization of any prepolymer). In this regard, it is preferred to use high density polyethylene or polypropylene in the applicator components because of their inertness in the presence of the adhesive compositions described herein. Other materials compatible with the adhesive compositions can be readily determined by the skilled artisan and include, for example, other polyolefins, such as, polyethylene (80A-80D), polyester polyether block copolymer (30D-80D), Alcryn (chlorinated polyolefin) (60A-80A), Pebax (polyamide polyether block copolymer) (25D-70D); fluoropolymers, such as, PTFE (polytetrafluoroethylene, such as Teflon™), perfluoroalkoxy resin, fluorinated ethylene propylene polymers, ETFE, and SEBS (styrene ethylene butadiene styrene); silicones; interpenetrating networks of silicone; nylons (6/6, 6/10, and 6/12) and polyamide. As seen from FIG. 4, and with reference to FIG. 2, during use, in order to close an incision  400 following surgery, tip 105 of applicator 100 is brought into close proximity to the incision, and hinged lever 224 a (FIG. 2) is depressed by the operator (not shown) with sufficient force to break ampoule 212 a and cause a small amount of the strong, fast-setting adhesive 402 contained therein to flow into region 210 a, through filter 222 a and channel 220, to the exterior of applicator 100. The strong, fast-setting adhesive is applied in spots 404 to the edges of the incision, in a manner analogous to spot welding, to provide a strong bond to retain the edges together at least long enough to apply the more flexible tissue adhesive contained in ampoule 212 b. Application of the more flexible tissue adhesive from ampoule  212 b is illustrated in FIG. 5 and takes place by bringing end portion 106 of applicator 100 into close proximity to the incision 400, either before or after ampoule 212 b is broken by action of hinged levers 224 b and 224 b′. Sufficient force is applied to hinged levers 224 b and 224 b′ to expel the flexible tissue adhesive from region 210 b, through filter 222 b, and out of the applicator 100. Filter 222 b is run along the incision 400 while sufficient pressure is applied to hinged levers 224 b and 224 b′ to cover the area of the incision and provide complete closure thereof. Optionally, the cyanoacrylate compositions applied by the present applicator can include a “biocompatible plasticizer”. As used herein, the term “biocompatible plasticizer” refers to any material which is soluble or dispersible in the cyanoacrylate composition, which increases the flexibility of the resulting polymeric film coating on the skin surface, and which, in the amounts employed, is compatible with the skin as measured by the lack of moderate to severe skin irritation. Suitable plasticizers are well known in the art and include those disclosed in U.S. Pat. Nos. 2,784,127 and 4,444,933 the disclosures of both of which are incorporated herein by reference in their entirety. Specific plasticizers include, by way of example only, acetyl tri-n-butyl citrate (preferably ˜20 weight percent or less), acetyl trihexyl citrate (preferably ˜20 weight percent or less) butyl benzyl phthalate, dibutyl phthalate, dioctylphthalate, n-butyryl tri-n-hexyl citrate, diethylene glycol dibenzoate (preferably ˜20 weight percent or less) and the like. The particular biocompatible plasticizer employed is not critical and preferred plasticizers include dioctylphthalate and C 2-C4-acyl tri-n-hexyl citrates. a first pressure device for imparting sufficient pressure to the first fluid to cause egress of same out of the applicator at said first end portion. 2. The applicator of claim 1, wherein the first pressure device is a first hinged lever having a first plunger portion for imparting said pressure. 3. The applicator of claim 2, further comprising a first hermetically sealed ampoule disposed in the first region and containing the first fluid, the first lever operating to destroy the integrity of the first ampoule such that the first fluid escapes therefrom. 4. The applicator of claim 3, further comprising a first filter for impeding the flow of broken pieces of the first ampoule out of the applicator. 5. The applicator of claim 1, further comprising a second pressure device for imparting sufficient pressure to the second fluid to cause egress of same out of the applicator at said second end portion. 6. The applicator of claim 5, wherein the second pressure device is a second hinged lever having a second plunger portion for imparting pressure to the second fluid. 7. The applicator of claim 6, further comprising a second hermetically sealed ampoule disposed in the second region and containing the second fluid, the second lever operating to destroy the integrity of the second ampoule such that the second fluid escapes therefrom. 8. The applicator of claim 7, further comprising a second filter for impeding the flow of broken pieces of the second ampoule out of the applicator. 9. The applicator of claim 1, wherein the first fluid is a fast-setting strong prepolymer adhesive and the second fluid is a prepolymer adhesive capable of forming a flexible sealant layer. 10. The applicator of claim 1, wherein the first fluid comprises n-butyl cyanoacrylate. 11. 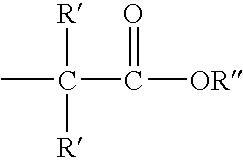 The applicator of claim 1, wherein the second fluid comprises octyl cyanoacrylate. 12. The applicator of claim 1, wherein the second fluid is a blend of butyl and octyl cyanoacrylate. 13. The applicator of claim 1, wherein the second fluid is a blend of butyl and decyl cyanoacrylate. ES04742916T ES2302540T3 (en) 2003-06-13 2004-06-11 Double ended applicator for dispensing two fluids, in particular glue components.